Rats! You've failed your smog test. Not because emissions from the engine/exhaust were outside the required limits, but because you got the dreaded "Fuel Evaporative Controls Functional" FAIL. And that's just what happened to me recently. What, you may ask, does "Fuel Evaporative Controls Functional" mean? Basically, the fuel system is leaking vapor to the atmosphere, bypassing the system that recovers and recycles fuel vapors coming from the fuel tank. See here for more information about the charcoal canister that is at the heart of the vapor recovery system on our older vehicles. First things first—how do they even know there's a problem? How do they detect it? It's pretty simple, especially on older vehicles like old Jeeps. 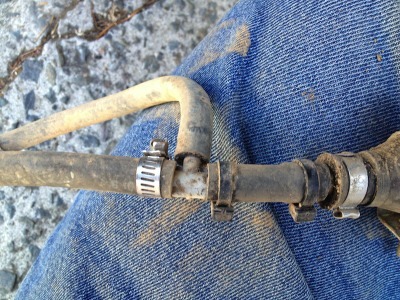 First, they disconnect the hose that runs from the top of the gas tank forward to the charcoal canister and either plug it or pinch it closed with vise grips. This is usually done under the hood right at the canister. Second, they attach a hose from the test machine to the gas tank filling hole. They use a special cap that fits on just like the gas cap but creates an air tight seal (which your gas cap should also do if it is working correctly). The test machine then pumps an inert gas into the gas tank and the various hoses that come from it. This is all done at low pressure—just a couple pounds psi will do the job. No need to use high pressure and blow off your various hoses. The test then monitors the pressure in the system for a period of time to see if it decreases. It's just a leak-down test. 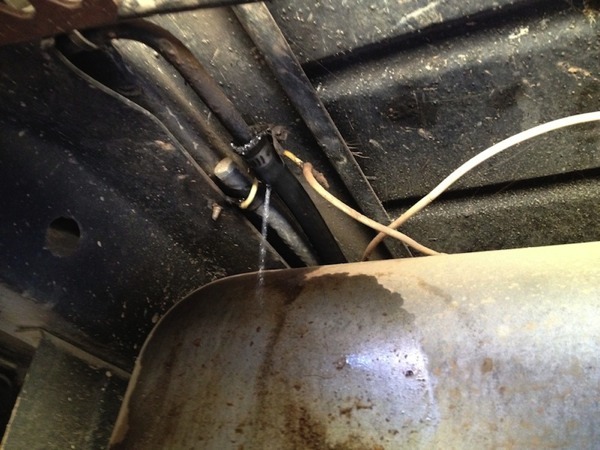 If there's a leak, and the pressure drops beyond what is considered normal for your vehicle, then it fails the test. Pretty simple and straight forward. 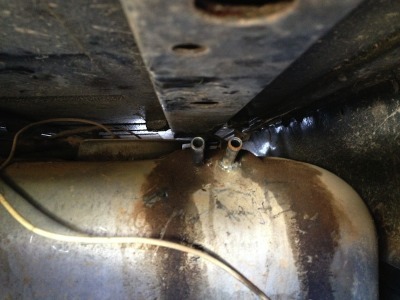 Here you see the hose removed from the charcoal canister (left) and the two vent holes at the top of the gas tank (right). These vent holes allow pressurized air and gas vapors to escape the tank rather than having pressure build up. In my case, the EVAP system failed due to a leak somewhere. Of course, the testing shop said they'd be happy to diagnose the problem (i.e., find the leak)—for a mere $129! They use a nifty smoke generator that fills the air space in the tank and the hoses with smoke under slight pressure (usually mineral oil-based) to make it easier to see where it is leaking. Of course, the shop will then also charge more to repair the problem once it is located. I figured I could do all this myself. So I rigged up a simple means of pressurizing my tank and hoses. One may buy the nifty gas cap adaptor for the filler hole, but they run about $50. Instead, I approached the system from the other end. I used the line to the charcoal canister as my entry point for air under slight pressure. 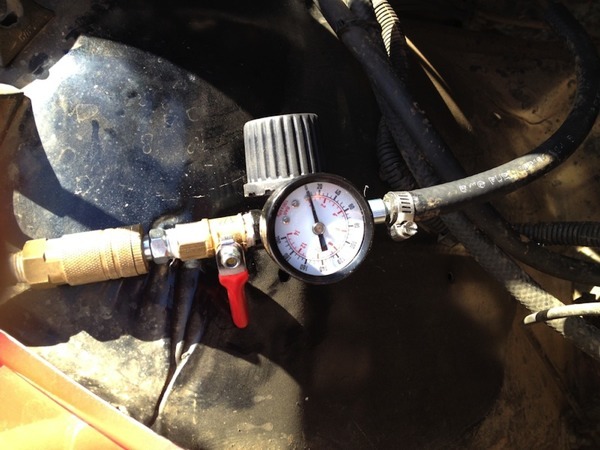 I rigged up an on/off valve and a regulator so as to allow no more than a few pounds of pressure psi into the system. Then I was able to climb under the Jeep in the back to listen for any leaks. Guess what I found? In addition to some tiny holes/cracks in the vapor lines the line from the fuel pump pickup in the tank that connects to the hard line running forward to the mechanical fuel pump was loose. Under slight pressure gas was just pouring out! This is probably why I keep smelling gas when I walk past the Jeep. That was FAIL number one right there! After fixing that issue by re-locating the hose clamp and re-tightening it was clear there were still leaks in some of the hoses (and at some point I'll drop the tank to replace this hose entirely, but that's a project for another day). The other hoses were mostly older and had cracks in them so it wasn't a surprise. The next step was to pull the rollover check valve (the two vents from the gas tank both go to the check valve—one for vapor escaping the tank and the other for liquid to return to the tank from the check valve). Turns out mine is not original and the two hoses from the tank connect in a "T" before one continues to the check valve. Here are two shots of the valve and the "T" connection immediately before the valve. A bit dirty but, once cleaned up the check valve worked exactly as it should. The line from the top of the valve (to the right in the picture below, right) runs directly forward to the charcoal canister. After cleaning up the valve, installing new hose to replace the old, cracked stuff and clamping everything back together I again pressurized the system. This time no gas escaped from the tank and I couldn't hear any leaking air from the hoses. Hurray! 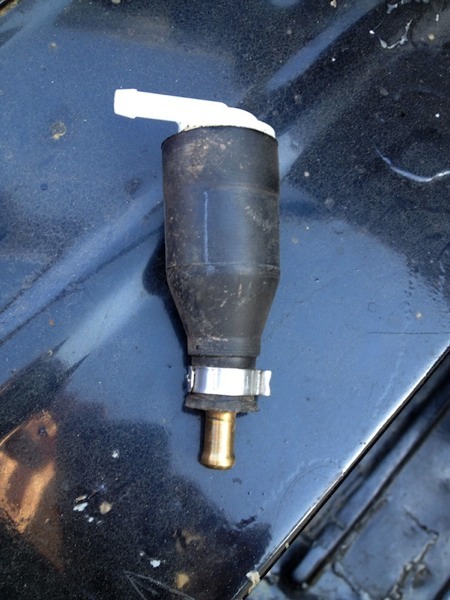 A word of warning: sometimes another culprit is the filler neck from the tank to the fitting that the gas cap attaches to. 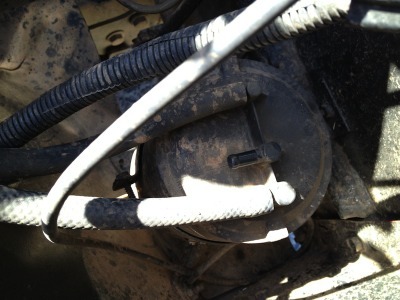 There are actually two hoses on the older Jeeps, one is a vent that connects to the main hose in another "T" fitting just behind where the hoses attach to the body fitting. Mine were fine, but it's always worth checking there too. 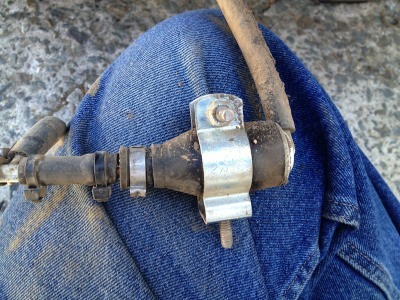 There's also the return line from the fuel filter designed to help prevent vapor lock. If you look closely at mine (the leaking fuel picture) you'll see that it is capped off. A previous owner decided for some reason not to run that line. Hasn't been an issue for me so I've never fixed it and it has no impact on emissions, etc.